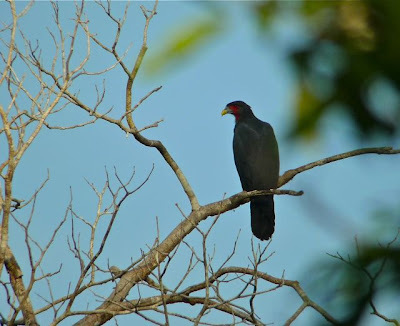 In part 3 of my series of posts about birding in Guyana, I promised to show you some of the birds we saw on our six-hour drive along the road from Rock View Lodge to the Iwokrama Forest Reserve and Ecolodge. My mind is back on Guyana for a couple of reasons. First of all there is just so much to share about my trip there. Secondly, the upcoming issue (July/August 2010) of Bird Watcher's Digest features Guyana in our regular travel column "Far Afield." Julie Zickefoose writes about her trip to Guyana in an article entitled "Journey to the Lungs of the Earth." 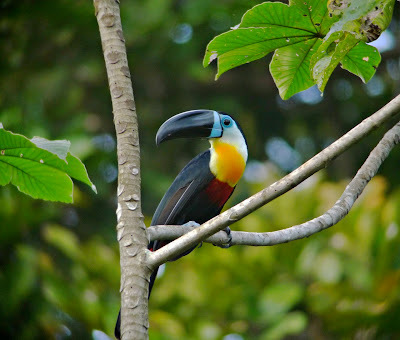 Thirdly, I've just finished the rough edits on a podcast about Guyana for "This Birding Life." That should be ready for listening within a few days. In our last Guyana blog post, we left off just after a flight from Georgetown to the Annai airstrip in the interior. 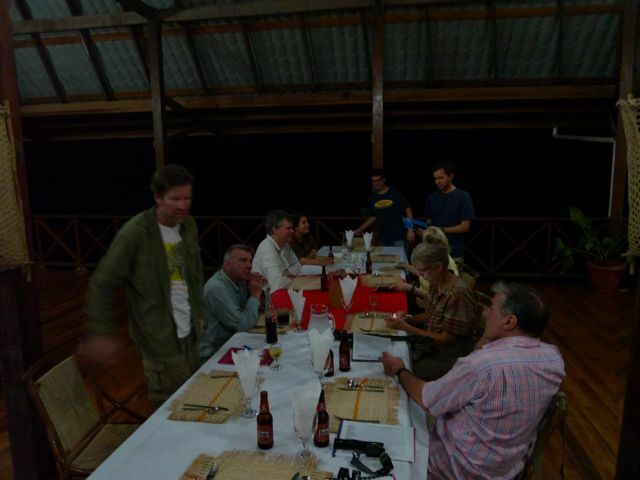 We lunched at Rock View Lodge and climbed aboard three 4 x 4 trucks for transport along the lone road in the interior of Guyana to Iwokrama. The road bed was red clay and very dusty. I felt lucky to be in the lead vehicle, which was also the lone truck with air conditioning. The day was as hot as the hinges of Hades, but even the delicious comfort of the cool truck cab could not keep us from leaping out each time we spotted a new bird. King vultures mixed with blacks and turkeys overhead. Several species of caracara added themselves to our list, including a screaming family group of red-throated caracaras. Small clusters of swallow-tailed kites skimmed the tree tops. The landscape was changing from open savanna scrub to forest edge and then to proper forest. As it changed, so did the bird life. Swallow-winged puffbirds sallied forth from snags. Macaws and parakeets whirred across the roadway opening. Roadside hawks lived up to their names. Strange bird shapes appeared everywhere, causing excited shouts from our truck. We'd get out, optics swinging onto targets and shout out names, or more likely families of birds, or even MORE likely things like "I have a large dark raptor with a long tail." 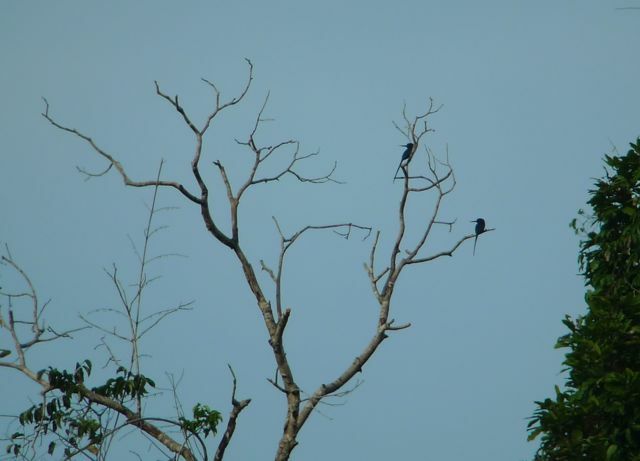 Or "I've got some sort of jacamar on that snag on the left." Distant yet unmistakable paradise jacamars. Or "Some tiny green thing is singing and hover-gleaning over here in this fruiting tree." Our guides helped call out the birds' names when they could. The farther along the road we we, the deeper and older the forest got. 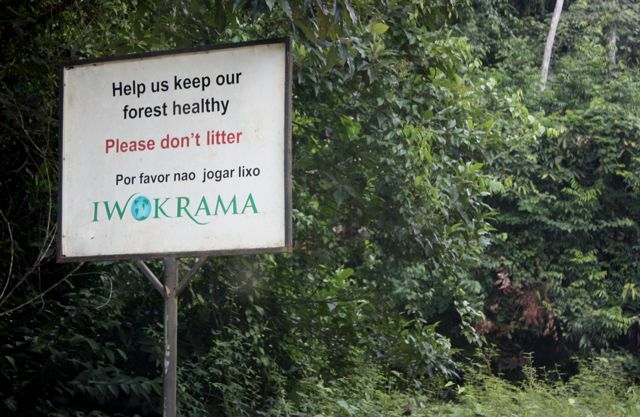 Soon we passed through the gate into the Iwokrama Forest Reserve and it was here that we entered the true rain forest. 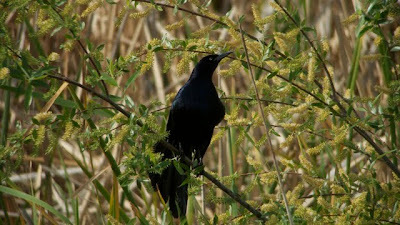 We continued driving and stopping for birds for the next few hours. When all the trucks in our convoy finally got together, our tour leaders told us we were running really behind schedule. Since we still had a long way to drive before reaching the Iwokrama River Lodge, we had to swear that we'd only stop for the rarest of the rare. Suggestions were made for what would qualify as a stop-worthy sighting: Jaguar, harpy eagle, and anaconda were all mentioned. I threw in "A Pittsburgh Pirates' World Championship" knowing full well that we'd be more likely to find the other three creatures together, playing poker in the middle of the road before I'd see the Pirates hoist the World Champion flag over their stadium. We made better time the rest of the way, but still stopped a few times. Once for a long, bright green snake that had been killed in the road. Stopping for a dead green snake. 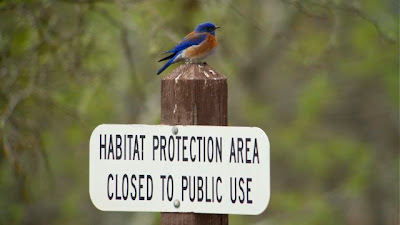 And a few times for new bird species. 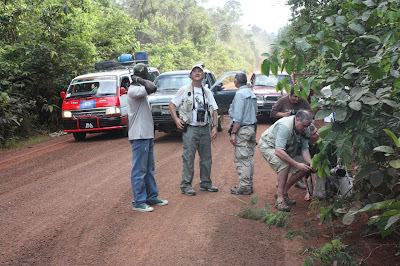 We arrived at Iwokrama well after dusk, dusty, hot, hungry, and tired—but happy for a great day of birding along the only read road in Guyana's interior. Here are a few of the bird images I captured that day. Muscovy ducks in a roadside slough. This winning caption was submitted by Ben Lizdas who blogs at 600 Birds. West Virginia's answer to I-bird. The ORIGINAL version of YouTube. Lee Peterson struggles to find the West Virginia Loon in Dad's field guide. No, no, no! Turn it back to WBLR! Thanks to everyone who played (except the spammers). These are among my favorite posts to create. Hope you had fun, too. This photograph is begging—crying out even—for a clever caption. 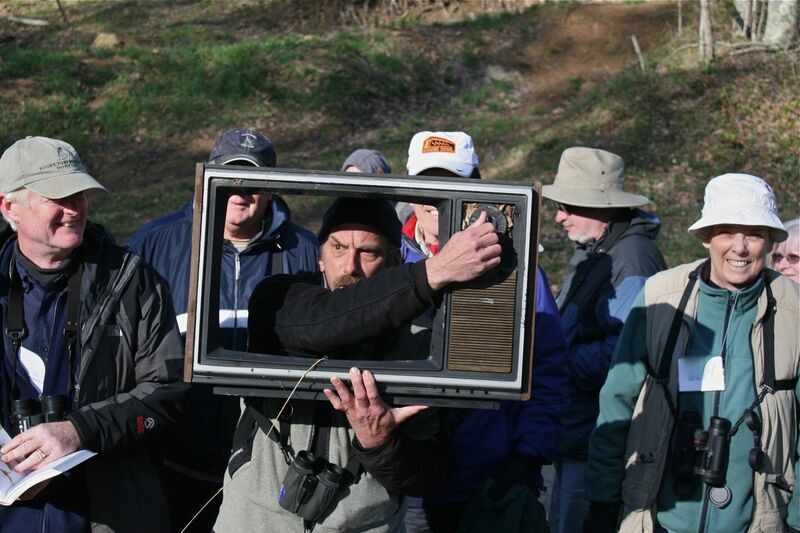 It's a shot I took of a bunch of birders (and an old TV) on top of a mountain in West Virginia. 1. You study the photo above. 2. You cogitate as long as it takes and then you write a clever, funny caption. 3. You enter said caption via the Comments link on this post. 4. We pick a winner. Deadline is Tuesday, May 25, 2010. 5. If it's your caption that wins, we'll send you a fabulous prize (see below). 6. You bask in the glory of your accomplishment and your general cleverness. Good luck to one and all and may the most cleverest among you win! When I joined the staff of Bird Watcher's Digest in May of 1988, computers were still fairly uncommon in the publishing business, at least on the editorial and design side of things. I began working with then-editor Mary Beacom Bowers in a small satellite office in Baltimore, Maryland and I remember that we each had nice electric typewriters and stacks of BWD letterhead plus carbon paper for conducting all of our correspondence. 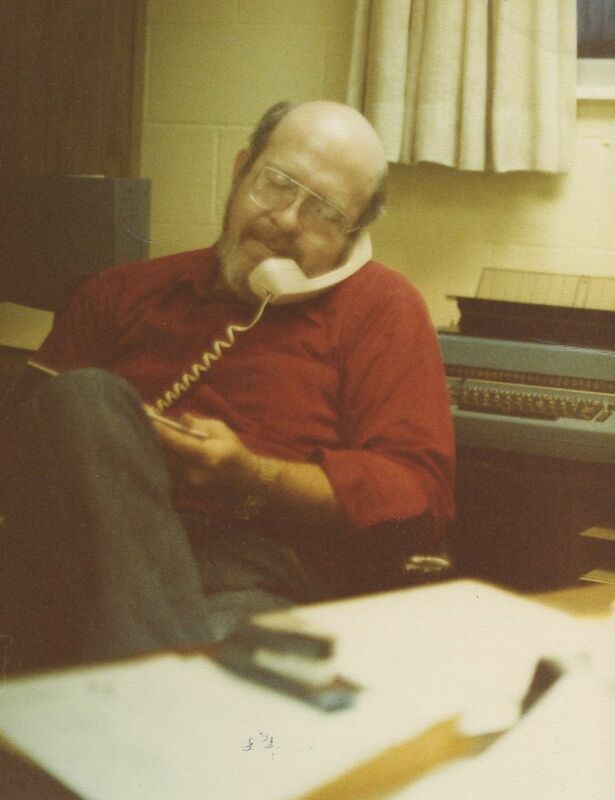 At the main headquarters office in Marietta, Ohio, BWD used a huge—literally room-sized—IBM AS-400 computer to keep track of our subscriptions, but everyone else was using the telephone and typewriter to communicate and work. By the end of that first year, I talked my dad into letting us buy two "facsimile" machines, so we could send important documents back and forth over the phone lines. E-mail, Fed-ex overnight packages, text messages, and so on, were all just a dream back then. By the end of my second year, I convinced my dad to let me buy a Macintosh computer: an Apple SE with its floppy disc drive, 40 K of RAM, a built-in screen, and something weird called "a mouse." I began experimenting with letter writing on this new machine, and even did some truly rudimentary page layout. It was the start of something big. My dad, Bill Thompson, Jr., co-founding publisher of BWD in the phone and typewriter era. I even remember talking with Dad about the concept of everyone at BWD having a computer on their desk. But we had no idea if that would be productive or if everyone would just play "Pong" all day long. Through the years, of course, the computer has become increasingly vital to the magazine publishing business. 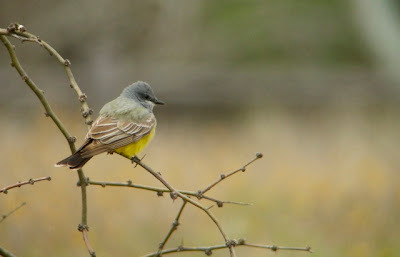 Today you cannot swing a catbird by the tail anywhere in our Marietta offices without hitting at least two computers. And there's simply no way I could have foreseen, nor any way I can convey the level of my joyful excitement, at what technology now allows us to do here at BWD. Last month we launched eBWD, our digital edition of Bird Watcher's Digest. It's just like the printed magazine but with more interactive features, such as video, audio, and clickable links! Click on any web address or URL and ZING! off you go to that web page. Interested in an advertiser's product? It's now just a click away. Want hear what the cerulean warbler song sounds like? Click on the words in the text and you'll hear it! 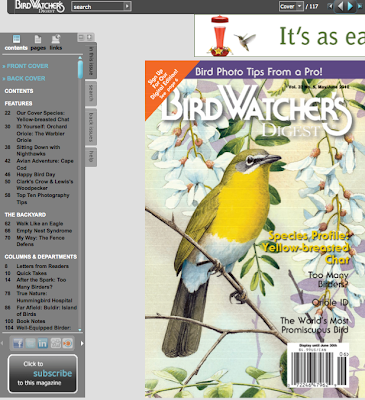 All print subscribers to Bird Watcher's Digest can access eBWD for free simply by logging in with an active e-mail address. And fear not: we are NOT going to get rid of our print magazine. The old ink-on-paper version of BWD ain't going anywhere. However, we are totally excited about all the things we can do in the digital edition—things that are simply impossible in print. Then there are the wonderful green advantages of supplying content to anyone in the world without consuming additional paper, ink, or burning fuel for shipping. That's good for the birds in the long run, right? 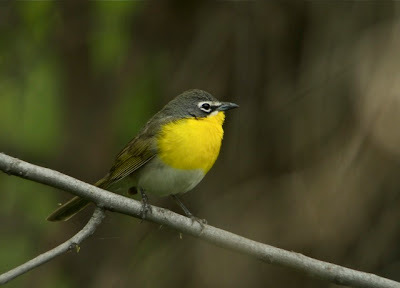 Our current issue (May/June 2010) features a male yellow-breasted chat on the cover—a lovely painting by the supremely talented artist John Sill. On the opening spread of the chat species profile, there's a link to a video of a male chat doing his crazy, looping courtship flight, courtesy of our friends at birdfilms.com. Several of our advertisers have added extra features to their ads. Here's the bottom line: If you are already a subscriber to BWD, you can access the digital edition (eBWD) for free with your e-mail address. If you wish to subscribe to the print version of BWD, it's $19.99 and you can do that here. Our digital edition looks and reads great on the iPad. If you'd prefer to ONLY read/access the digital edition, that's just $15/year for six issues. A three-issue mini-subscription is $10. And a single issue of eBWD can be yours for just a five-spot ($5). You can read the mag via our online interface or download it for later reading on your computer, smart phone, or digital reader. Once you've checked out eBWD, if you see something you like, there are amazingly easy ways for you to share an article with your friends via e-mail, via any of the social networking sites, or via a custom widget for your own web site or blog. It's an exciting time to be the editor of a little bird magazine from Marietta, Ohio. Never in my wildest dreams would I have imagined this. But I'm so very happy to be living in these incredible times. To quote Kip from "Napolean Dynamite" "Yes, I love technologeeee!" Anyone can have a free look inside the current issue of eBWD. I'd LOVE to hear your comments and reactions, ideas, and suggestions. 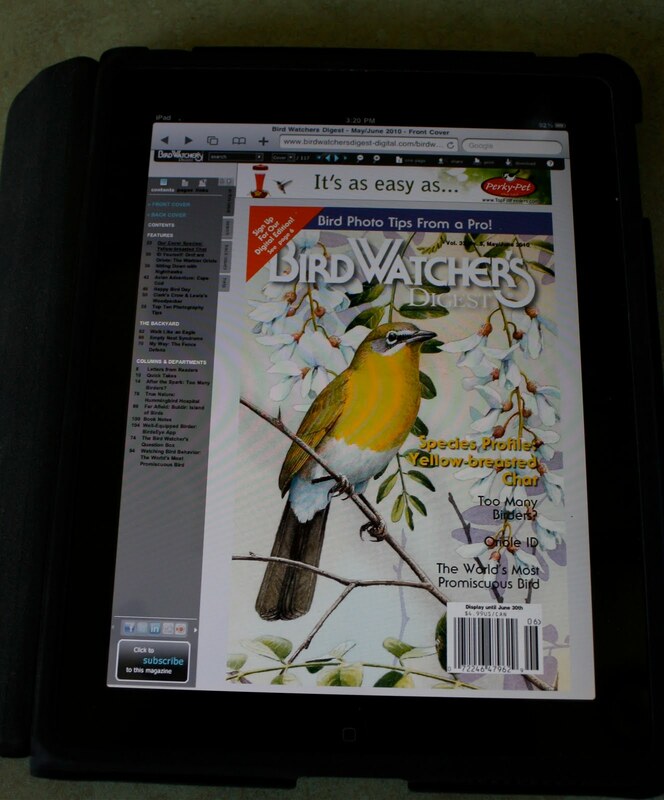 Until then, good birding and good reading! The sparrow formerly known as Nelson's sharp-tailed sparrow is now just Nelson's sparrow. In about a month, on the wide open prairie of central North Dakota, one of the most charming and wonderful birding festivals will be in full swing. Carrington, North Dakota will be invaded by bands of excited birders for the annual Potholes & Prairie Birding Festival, one of my favorite events every year. 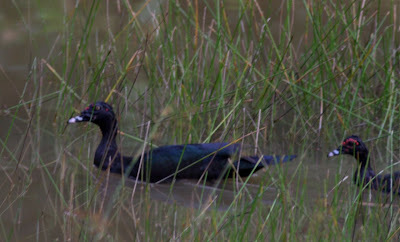 If one or more of the bird species listed below sounds appealing to you (or remains unchecked on your life list) you should consider coming to Carrington for the 2010 festival, which runs from June 9 to 13. Among the target/highlight species: Chestnut-collared longspur, Sprague's pipit, Nelson's (sharp-tailed) sparrow, LeConte's sparrow, Baird's sparrow, gray partridge, sharp-tailed grouse, ferruginous hawk, white-rumped sandpiper, plus large numbers of waterfowl and shorebirds. A prairie pothole, left behind after the last glaciers receded. 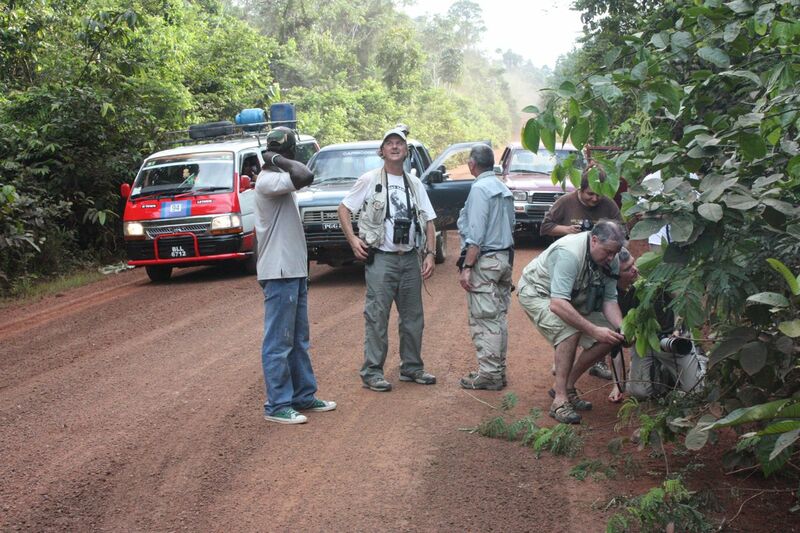 The P&PBF is a relatively small event, so field trip groups are small too, with expert local leaders. It's hard to get lost in a place where all the roads run at right angles to one another. 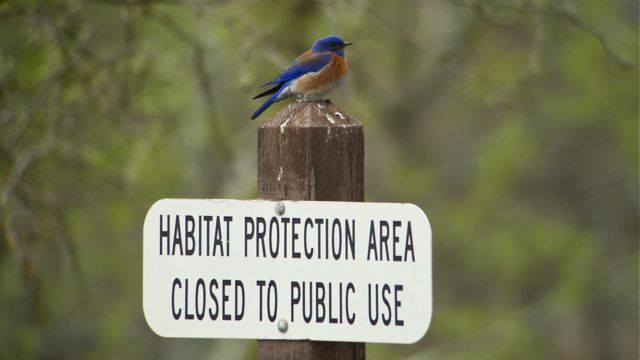 You can stop to look at birds along most of these roads and rarely have to worry about oncoming traffic. Spending time on the wide-open prairie does one's soul good. So does the delicious soup and pie at the local cafes where we often eat lunch. I'll be in North Dakota again this year for the Potholes & Prairie Birding Festival. Good spots are still available for this wonderful event and I hope you'll consider joining us. 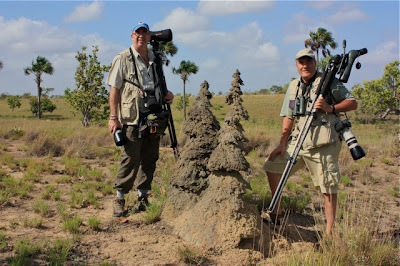 From left to right: me, termite mound, Tim Appleton MBE on the savanna in Guyana with all of our gear. During the 10th annual Verde Valley Birding & Nature Festival in Cottonwood, Arizona (an event I highly recommend) I lead a trip, gave a talk, and did a bit of birding on my own. And I did this without the weight of a "real" camera hanging from my shoulder. My big lens has issues, it appears, and needs to be fixed. 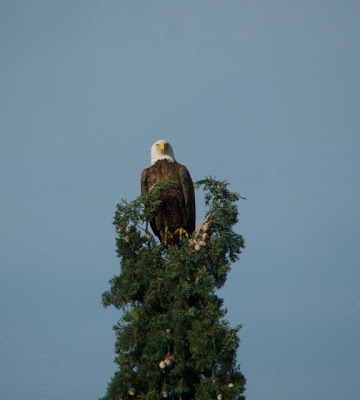 With my Canon 300mm lens sent off for rehab, I've been limited to digiscoping. Well, perhaps 'limited' is the wrong word. 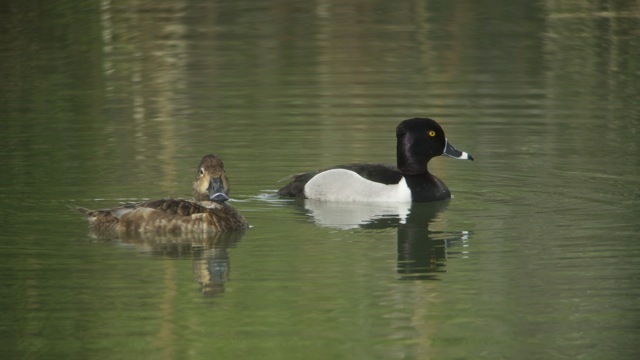 Given relatively cooperative birds, digiscoping can result in some wonderful images. I'm using a Leica D-Lux 4 digital camera with a Leica digital adapter, and a Leica 85mm spotting scope. It's a pretty user-friendly set up, I have to say. Digiscoping and birding go together really well. A professional photographer friend of mine once told me (and repeated this many times since) that you can either go birding or you can be a bird photographer, but it's almost impossible to do both well at once. Bird photographers, like my friend, tend to find a cooperative bird or spot and work it for an extended period. 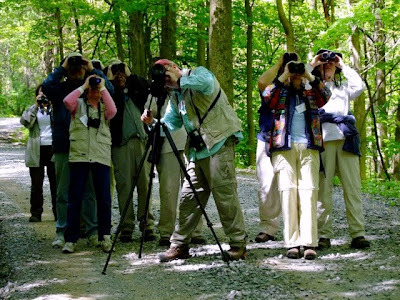 Birders can lose patience with this because they may want to move on to the next birdy spot. Many birders are now avid digiscopers. Photo ©David Tipling. Then there's the equipment. 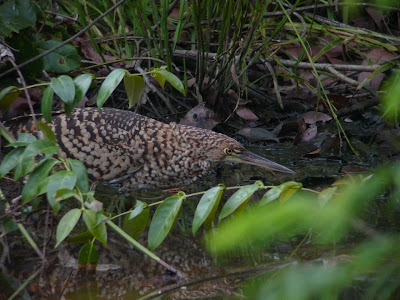 On my recent trip to Guyana most of us had all of our birding gear (binocs, guide, scope, small camera, etc) plus a big camera or two to take "serious" photos. After a dingle day in the field I stopped carrying my big Canon 30D with the 300mm lens and focused on digiscoping. The couple of serious photographers on the trip each had multiple cameras, lenses, plus their birding binocs, and a backpack for all of this. They eventually stopped carrying their scopes since I had mine. Not only was this melange of gear physically challenging for us, it was hard to keep it from knocking together, or from taking a beating from the climate and setting: dust, rain, humidity, heat, lack of power. 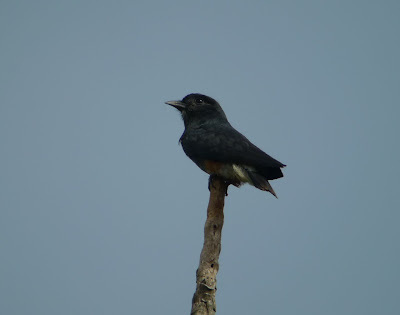 I'll write more extensively about digiscoping in Guyana in a future post. Being without my big lens has felt somewhat liberating. In my two most recent festivals, in Arizona, and at the New River Birding Festival in West Virginia, I was solely digiscoping, which fits better with being a field trip leader, too, since I always tote and operate the spotting scope. After everyone has seen a bird in the scope, if the bird obliges, I snap a few shots with my digiscoping camera, which I carry on my hip in a small pouch. 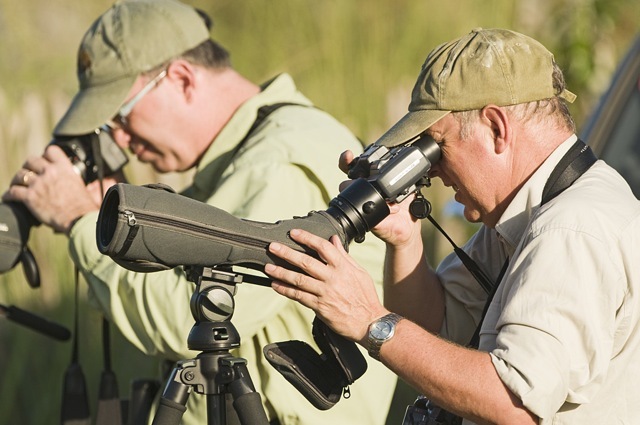 If you'd like to find out more about digiscoping from one of the pros, I suggest you go to a birding festival where the field reps from the major optics companies often hold seminars on this subject. If you get a good camera/adapter/spotting scope arrangement, digiscoping is so easy it will surprise you. 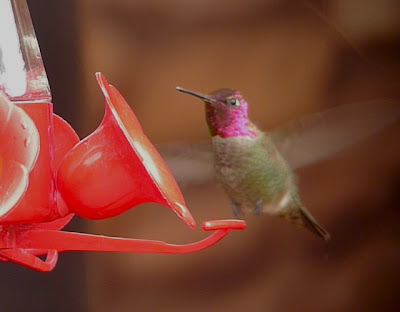 I'll stop there for now, and drop a little Arizona digiscoped eye candy on you. A pair of ring-necked ducks. Bald eagle, cue the red-tailed hawk scream. 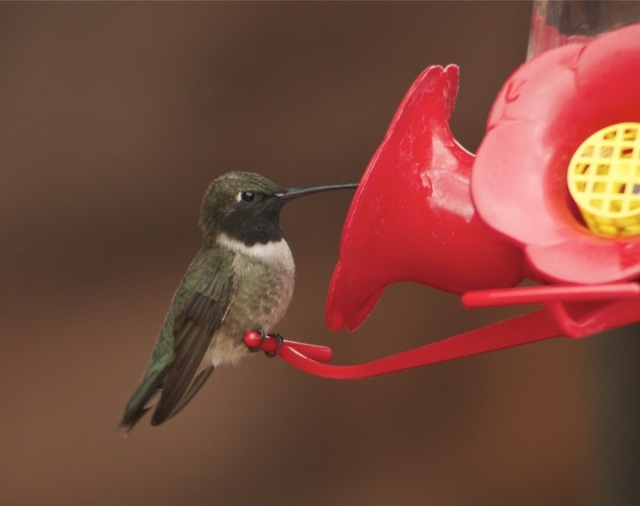 Male black-chinned hummingbird, gorget not flashing. Male Anna's hummingbird in all of its blurry gorget splendor. Male painted redstart along Oak Creek. After a couple of weeks of festival travel, speaking, performing, and guiding, I'm looking forward to a spell at home and this birdy time of year. For the first time in at least a decade I'll be home for a large chunk of spring migration, and I'm looking forward to it. If this morning was any indication, we're in for a late rush of migrants. I had 55 species on the farm in just under three hours, and that was all within hearing distance from the house. Now I'm in town at work at Bird Watcher's Digest and there is a different set of birds here, so by the end of the day (despite work and other "distractions") I should easily pass 70 species. 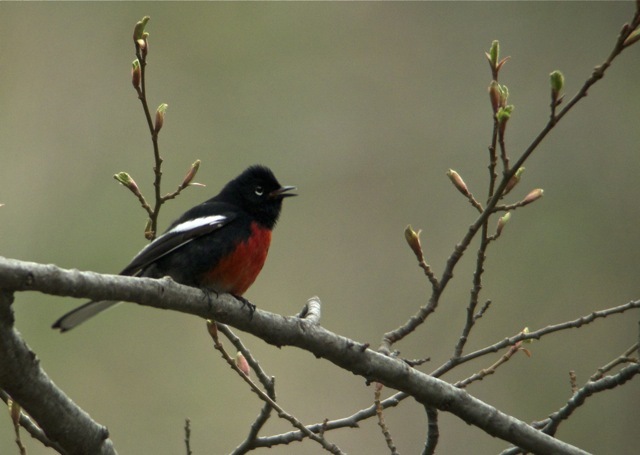 Wishing you a beautiful and birdy spring.